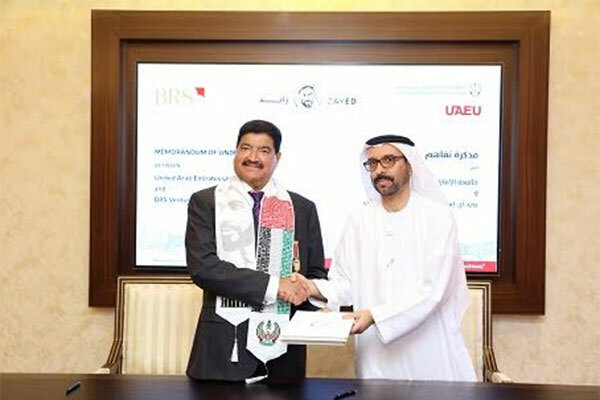 BRS Ventures, a top holding company in Abu Dhabi, and United Arab Emirates University (UAEU) have signed an agreement to provide graduate placement opportunities for students graduating from UAEU. Deserving students will be given preferential placement at various entities held by BRS Ventures, a statement said. Career advice, participation in careers fairs, practical exposure of working in the corporate world will be made available. Competent students will also get to spend 8 to 16 weeks as internship, at BRS Ventures companies. The collaboration with a UAE based education entity is a first for BRS Ventures. The memorandum of understanding (MoU) is part of BRS Ventures’ Year of Zayed celebrations. Speaking on the occasion, Dr B R Shetty, founder and chairman of BRS Ventures said: “UAE is the land of opportunities. Whatever I am today, is because of my inspiration – H. H. Sheikh Zayed and benevolence of the royal family. Dr Ateeq Almansoori, associate provost for Students’ Affairs, UAEU, said: “It helps both parties benefit from each other’s capacities through joint programs, and communication in various fields of joint interests.